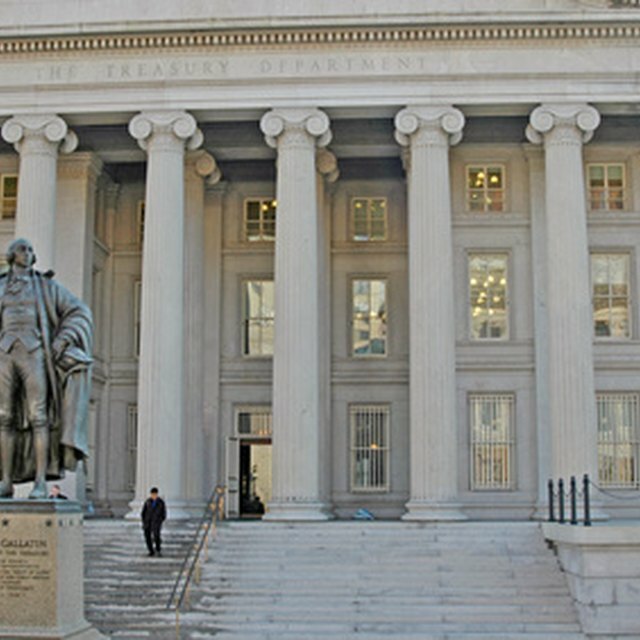 U.S. Treasury bills or "T-bills" are a class of government debt securities that mature in one year or less (one-month, three-month, six-month and 12-month terms). Unlike other securities with longer terms, T-bills don't have coupon payments, which are guaranteed payments in addition to interest during the life of the security. Rather, T-bills are sold at a discount of what they will be worth at maturity. For example, a six-month T-bill that can be redeemed for $1,000 at maturity will be sold by the U.S. Treasury to an investor for $970 at the beginning of the term. A debt security's "yield-to-maturity (YTM)" refers to how much of a return it will provide if held to maturity. However, YTM is usually calculated by the year. To calculate YTM for a security maturing in less than a year, you need to calculate the "Bond Yield Equivalent (BYE)." Subtract the asking price of the T-bill from its par value, the dollar amount that the T-bill will be redeemable for at maturity. Divide the answer from Step 1 by the par value. What Is an RBI Bond, and How Does It Work? What Is the Difference Between a Treasury Bill, Treasury Note & a US Savings Bond? What Are 10-Year Treasury Notes and How Do You Buy Them? Are 10-Year Treasury Bonds Exempt From Federal State & Local Taxes? Divide 182 days (the term of the T-bill) by 364 days (the number of days in the financial calendar year). Divide the result from Step 2 by 0.5 (the result from Step 3). Multiply by 100 percent to convert the BYE to a percentage. By substituting this value for YTM, you can better compare the attractiveness of a six-month T-bill compared to securities with multi-year terms. While accurate over the term of the T-bill, this technique is not necessarily accurate over the course of the year. This model assumes that you are able to purchase a second six-month T-bill for the exact same price after the first one reaches maturity. However, this may not be the case. Once the first T-bill reaches maturity, you need to calculate the BYE for the current asking price. Depending on this new price, the BYE may no longer be more attractive than other securities.